We had lots of fun yesterday at Frog’s Dress-Up Party. I thought I’d share this one by breaking it up into a few posts along with some Iinks if you are interested in having your own dress-up or movie/theatre party. The whole thing was very inexpensive and lots of fun. This post is all about the food. With lots of dress-ups hanging everywhere it looked like a dressing room backstage at the theatre, so the food was along that theme also. You can buy some of these gorgeous vintage popcorn bags here. The glitter star wands were made using this shortbread recipe, some bamboo skewers, cachous, edible glitter and creative children. You can find out how to make these fun popcorn cupcakes here. (water bottles and much more) head over here. A cheat’s cake using one Barbie, a 4 litre bucket of icecream, some maltesers and some sparkling, glittery fabric and ribbon. Served with mini icecream cones. The icecream cake meant I did not make choc-tops which would have been perfect Aussie movie/theatre food! 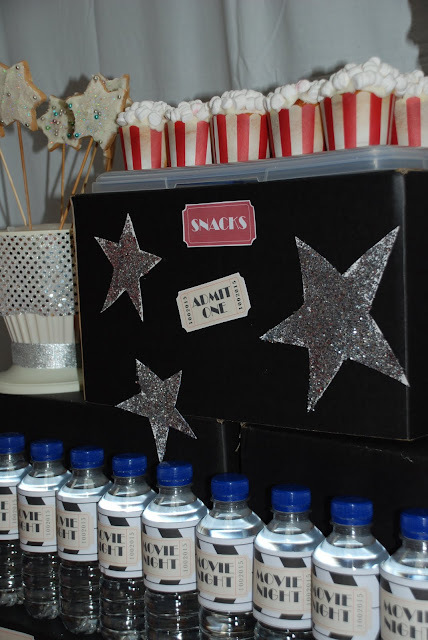 This idea and other great movie party ideas (along with free printables) here. Jaffas would have been perfect here also. Star sandwiches and star cheeses. Happy Birthday Frog.<br />Looks like you had the best birthday party. Fantastic party Emma! Love it how everything comes together. Did you have icecream under the fabric of the skirt though, or did you leave it in the tub? Love the popcorn cupcakes especially! And now I&#39;m breathing…<br /><br />…there&#39;s a birthday party looming and you just made all of that look uber easy. Happy birthday kidlet. This is definitely your &#39;thing&#39;, isn&#39;t it?! It looks absolutely fantastic and I&#39;m sure your children know how great a mum you are to do the bestest birthday parties ever! it all looks amazing!! you really have a talent at putting a party together… lucky for your gorgeous little frog. bet she loved every second! Oh Emma, I love love love it. I wish we lived in the same city – I would seriously hire you to do all my parties. I find it stressful – fun, but stressful.